A small, compact Accipiter appeared from the SE. I glassed it and remained silent. A few seconds later, I called it….”Coop’…it’s a small one…a male...but Coop!” Silence. 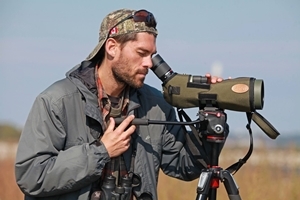 Three seasoned birders had the bird in their scopes. I knew what they thought, and I didn’t budge. Not a sharpie…and I thought “don’t even think it, Jon…hold stready!” I answered their silence with ID points: “Proportionately long tail, but most important…check the body…evenly lean…not big-chested and thin-waisted.” As it banked “note the head projection…though small…it’s there.” I didn’t once view the tail tip…that would be viewed afterward, while reviewing the pics; we would look to see if the tail feather lengths were graduated. We all reviewed the pics afterward and chatted about the bird. Group consensus: Cooper’s 🙂. Resuming scanning the skies, a smile of satisfaction could be detected on one of the watcher’s faces. Challenge (identify a tiny Cooper’s in flight)…accepted! 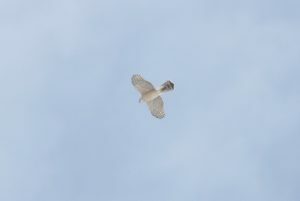 Photo: Here’s a crop of the bird as it flew high overhead. Michael Tate.